To prevent bears from getting in your trash, we encourage customers to consider purchasing an animal-resistant enclosure or bear shed. TTSD does not sell bear sheds, however, we have compiled a list of local vendors who sell county and town-approved bear sheds. Be sure to check with local communities, homeowners groups, governing entities or public works departments to become aware of any restrictions on enclosure types or placement. 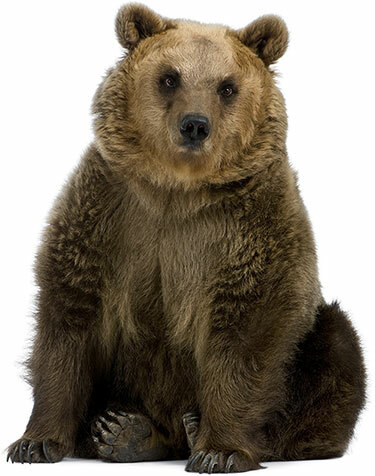 Some jurisdictions, such as Placer County, require the installation of bear sheds for new home construction, remodels exceeding 500 square feet or after repeated bear intrusions. A loan program is available for residential homeowners in eastern Placer County looking for a simple way to fit the cost of bear-resistant garbage can enclosures into monthly budgets. Under the program, eligible homeowners who live in unincorporated areas of Placer County east of Colfax can apply for a five-year, interest-free loan that would be repaid through $22 per month surcharges on quarterly garbage bills. Double-can enclosures are preferable to single waste can models as they allow for the protection of occasional extra garbage, as well as participation in the Blue Bag Recycling Program in which Blue Bags must be separated from the regular garbage. Single door entry. The fewer the doors, the fewer the access points for a marauding bear. Also, single door access is more likely to be properly secured by the user (homeowner or renter) and thus is more resistant to animal break-ins. Doors should be large enough to easily remove a lidded 32-gallon can, plus any extra bags or boxes, without spilling contents. Front-door entry. In some top-door enclosures, water can collect and freeze, icing the top doors shut and/or seep from the doors into the garbage cans, resulting in excessive weights, icing problems, and seepage from cans. Some models have corrected the problem by using a gutter. Avoid top hatches. Units with additional top hatches are prone to ice and water issues. Top hatches may freeze shut. Top ports can also leak water into the garbage cans, resulting in excessive can weights and related extra charges. Plunging pins securing both top and bottom in locking mechanism. Keyed flush-mount entry lock. Protruding handles and surface-mount locks are more likely to be broken by bears. Standard key access for this area is the solid square key. Tapered keys are less likely to get stuck or remain positioned in the lock mechanism. Inside safety levers for emergency egress to help prevent children from being locked inside. Rolled metal at access points. Flat metal door edges tend to provide an easier grip for the claw of the bear. Rolled metal door edges provide strength to the door (to prevent bending) and a more difficult edge to claw open. Roofs ideally shed snow to the side or back, never in front of the access door. Roofs that shed forward will drop snow in front of the door, blocking access or requiring more disciplined maintenance. Note, it is our experience that enclosures which shed forward are more likely to spill trash within the rear of the unit. Air vents, to minimize the accumulation of odors and to provide air flow for any entrapped animals. A seller who stands behind their product. Be certain the person who sells the product is ready, willing, and available to repair any problems or damages that may arise. Keyed units must be fitted with 1/4″ tapered square-key flush-mount entry lock. Tapered keys are less likely to get stuck or remain positioned in the lock mechanism. Standard keys are difficult to handle and use in icy conditions. No top door access only. Vertical lifts cause injury. All units must have side door access available for servicing. TTSD is happy to meet with you at your site, free of charge, to discuss the most suitable location for your enclosure. Enclosure placement must be in an area proximate to the roadway, no further than the jurisdictional limits from the county or town maintained road. 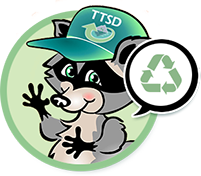 Placements outside of stated limits will require additional weekly service fees for TTSD staff to service. Limits generally fall between 15 to 25 feet, depending on your jurisdiction. Prior to installation, contact us to confirm your site’s distance limit. All enclosures should be elevated above the ground to prevent access problems with ice and snow. Single pole mounts should be sufficiently sturdy to withstand bear attacks and snow load. Enclosures must be located in an area where there exists a flat, open, and stable surface directly in front of the door(s) allowing safe and easy access. Door(s) must have ample space to open fully. Check with local communities, homeowners groups, governing entities, or public works departments to become aware of any restrictions imposed on enclosure types or placement locations. Latch doors firmly in closed position. Keep ice out of all locking mechanisms to maintain access.. Never leave key in lock mechanism. If keys are left in the lock, it is possible a bear will strike or put pressure on the key causing damage to the lock mechanism. – Our access is subject to conditions of area road maintenance by the county or town. In the event of severe winter weather, routes will be collected as conditions permit. We will make reasonable efforts to return to areas, but service cannot be guaranteed if conditions outside of our control prevent our access. Additional charges will apply in the event we are requested to return prior to the next service day. We are not responsible for extra charges accumulated beyond our control. – Maintain a clear, unobstructed path to units, including removal of roadside snow berm. Shoveled paths must be minimally 36″ wide cut in as direct a line as possible from the roadway. Paths, including stairs, cannot be constructed of hard packed snow or ice as they pose slip and fall risk to collection personnel. Paths must have open vertical clearance with no overhang or potential for collapse. We will not service snow tunnels as they pose potential for injury (e.g. stooping, awkward lifting, head trauma). – All units must be kept clear of snow and ice to allow doors to swing freely and fully. Keep vehicles from blocking access on your service day. Sufficient space must be maintained to allow opening of the unit door and hauling of cans without risk of damaging any nearby vehicle. Travel path should be minimally 36″ wide. Even the most docile pet can become protective of its environment, posing risk to our staff. Dogs should be leashed or kept inside. Educate all tenants on proper usage of unit. Be aware of others who may use your unit in your absence. Report abuse to authorities. In cases where units are used as a common enclosure for the containment of multiple accounts, all cans and bags should be clearly marked with customer’s name and address. Unmarked items will be distributed equally if unknown. Garbage must be placed out by 6:00am on the service day. Route collection times may vary. If trash is not available at time of arrival, return for service will incur extra charges. Contain waste in tied bags or cans. Individual cans, bags or containers must neither exceed 32 gallons in volume nor 51-60 pounds in weight. Each 32-gallon can serviced represents at least one can. Keep blue bags separate from regular waste. Cans filled with material exceeding the waterline will incur a charge for an extra can, even if the excess material includes blue bags. Bag all polystyrene packing material for proper containment during transport. Some local businesses accept clean polystyrene for reuse. Hazardous waste is prohibited. Separate programs exist for the safe and responsible disposal of small quantity household hazardous waste. Small household batteries are accepted if placed in a transparent zip lock bag, separated in a manner obvious to the collector. Do not place hot ashes in the unit for collection as they will likely cause fire either in the unit or in the collection vehicle. Residents are responsible for all messes at the property location. Under contract, TTSD is required to clean-up messes of a certain size and to charge the customer. Larger messes encountered on-route will be left and reported to the governing jurisdiction. Lids are not necessary in most cases, however, lids securely fastened on cans may help to suppress odors and prevent animal intrusion or water absorption. If you do use a lid, be aware that garbage placed on top of the lid may sink the lid to the bottom of the can and be discarded with the can contents. In such cases, TTSD is not responsible for the loss of the lid. If lids are used, customers are responsible for managing and keeping lids in place. We will not service screw-on lid type cans. Never allow children to play in, on, or around enclosure. Enclosures should utilize interior safety levers for emergency egress to help prevent children from being locked inside. Check weld points for cracks or warping. All metal seams should be inspected to repair warps or bent edges. Flat metal door edges tend to provide an easier grip for the claw of the bear. Rolled metal door edges provide strength to the door (to prevent bending) and a more difficult edge to claw open. Attend to any rusting issues in weld points or areas that need repainting. Check the cement pedestal for cracks or shifting of soil. Unit should be level and securely mounted. Oil/grease the hinges and survey for any damage. Be certain doors swing and close properly without gaps. If the door is damaged, do not force it closed, as it will probably damage the hinge. See your representative for repair. Inspect and oil the lock mechanism. Locking mechanisms should have plunge pins that secure the top and bottom of the door. Check that pins are not bent and that receiving holes are not blocked. Check the interior safety lever to confirm it functions properly. Check garbage cans for natural wear and tear. The act of sliding cans in and out of the units naturally abrades the can bottoms over time. The can walls are subject to splitting from outward pressure. Handles will eventually break from repeated lifting. Keep a clean shed to avoid odors. Routinely pick up litter and wash out any residue that may attract pests. Check for and remove any nests (e.g. hornets, wasps).